Aml Pages 9.86 build 2775 released. Added new nodes filter "Latest 60 days". Added: more info into menu tooltip for command of nodes filters. Improved: tags pane. Added: menu command "Properties of INI-file of settings". Fixed for plugins engine (work with nodes filters). Details change log see here. Details change log see here. 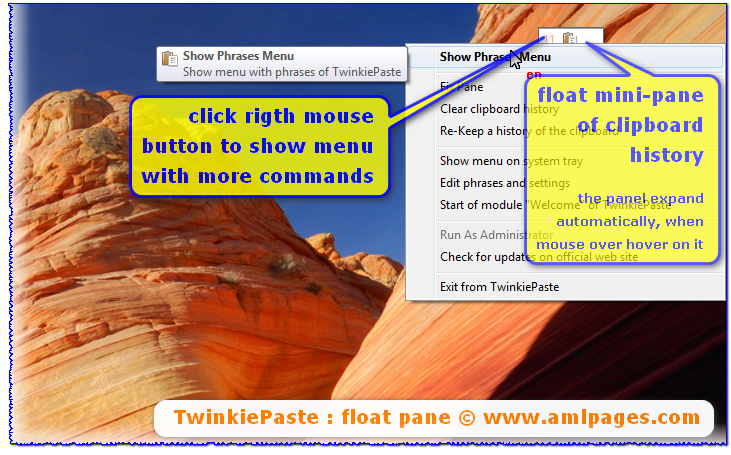 New version TwinkiePaste 2.90 build 553 released. Added: support of HTML Format in Clipboard History (see menu on right click in the float pane of TwinkiePaste). Added: button "Pin" into float pane. Added command: Copy As HTML. Added command: Copy As RTF. Aml Pages 9.85 build 2774 released. Fixed: nodes filters "By Categories", "With Attached Files", "With Comments", fixed: working of filters by dates, added: nodes filter "Last 30 Days". Details change log see here. Aml Pages will be available FREE on Giveawayoftheday at Wednesday, February 13. 24 Hours only! Added: offers in report about checking of updates. Added: no blink cursor under HTMLayout and Sciter windows. Added: hyperlink to article about Aml Maple in Wikipedia. Updated language files of user interface (*.lng). Details change log see here. You can download version with installer or portable versions. • Updated: Russian language of user interface. Details change log see here. You can download multilingual version with installer or portable version. New post in mailing list" «Bug fix release: Aml Pages 9.85 build 2768». Previous announcements see here. Announcement of Aml Pages 9.85 is published. Previous announcements see here. Aml Pages 9.85 b2764 released. • Updated: Polish and Russian languages of user interface. Special offer for users of TwinkiePaste from Giveawayoftheday. The new version: RSSme 1.27 released . RSSme is free, lightweight and user-friendly RSS editor. • Added: German language of user interface. • Added: submenu is used when clipboard history items are over 15. New video about TwinkiePaste: How to insert, text snippets, start Google Search via TwinkiePaste. Aml Pages 9.84 build 2760 released. Impovements for password of nodes, many small changes and bug fixes. Details change log see here. Announcement of Aml Pages 9.84 see here. CyberMonday! 50% discount for all products. Today only. The deal is done. Today, October 10 only TwinkiePaste will be free on Giveawayoftheday. License: no free updates, no technical support. The deal is done. What next — see here. You can buy full license at discount for TwinkiePaste, Aml Pages, Aml Maple. Announcement of Aml Pages 9.84 is published. Previous announcements see here. Aml Pages 9.84 released. Added: protection of nodes by user password (see menu "Nodes"). Added: hints for user passwords for nodes. Added: setting "Save passwords for nodes during session of work". Fixed: invalid exctraction of URL from text editor on changing of hyperlink. Details change log see here. Announcement of Aml Pages 9.84 is published. New version TwinkiePaste 2.78. Added: commands "Search In" (Google, Wikipedia and etc) into context menu of float pane. Details change log see here. 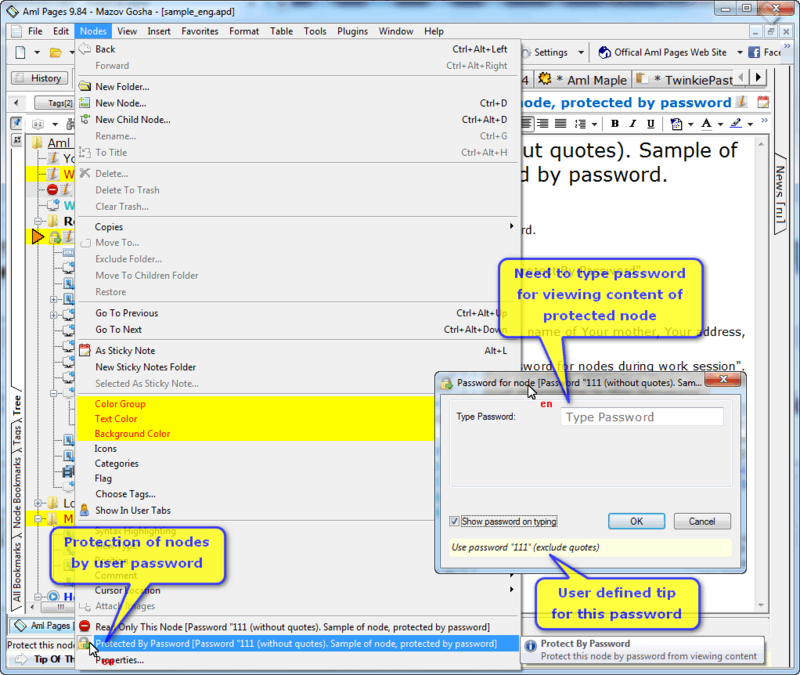 New post in mailing list: Aml Pages — Q+A: How to edit hyperlink names (title) in the editor? Previous posts see here. Aml Pages 9.83 build 2753 released. Improvements and bug fixes for insertion of hyperlinks. Details change log see here. Announcement of Aml Pages 9.83 see here. Previous posts see here. Aml Maple 5.42 released. Details change log see here. You can download version with installer or portable versions. Aml Pages 9.83 build 2752 released. 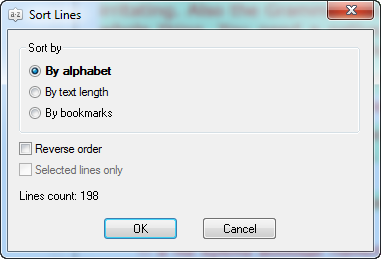 Added: sort lines in text editor, new algorithm for zoom of toolbars on HighDPI monitors, new settings, fixed many bugs. Details change log see here. Aml Maple 5.40 released. Added: menu command "Settings" show last used tab from "Settings" dialog. Updated language files of user interface. Details change log see here. You can download version with installer or portable versions. New version TwinkiePaste 2.75. Added: smart trimming of menu name include begin and end of text. Details change log see here. Announcement of Aml Pages 9.83 is published. Previous posts see here. Aml Maple 5.39 released. Details change log see here. You can download version with installer or portable versions. April/7/2018 Aml Pages Q+A: How to join lines? New post in mailing list: Aml Pages Q+A: How to join lines? Previous posts see here. Aml Maple 5.38 released. Details change log see here. You can download version with installer or portable versions. Aml Pages 9.82 released. Details change log see here. You can download English version with installer or portable versions. Localized versions see here. Announcement of new version Aml Pages 9.82 part 2. Previous posts see here. New video: How to enter license data into Aml Pages. Aml Pages at 30% discount on BitsDuJour — the deal is valid now. • updated Russian language file; Details change log see here. Aml Maple will be available at 50% discount on BitsDuJour today — February 10, 2018. Aml Pages 9.82 build 2729 released. 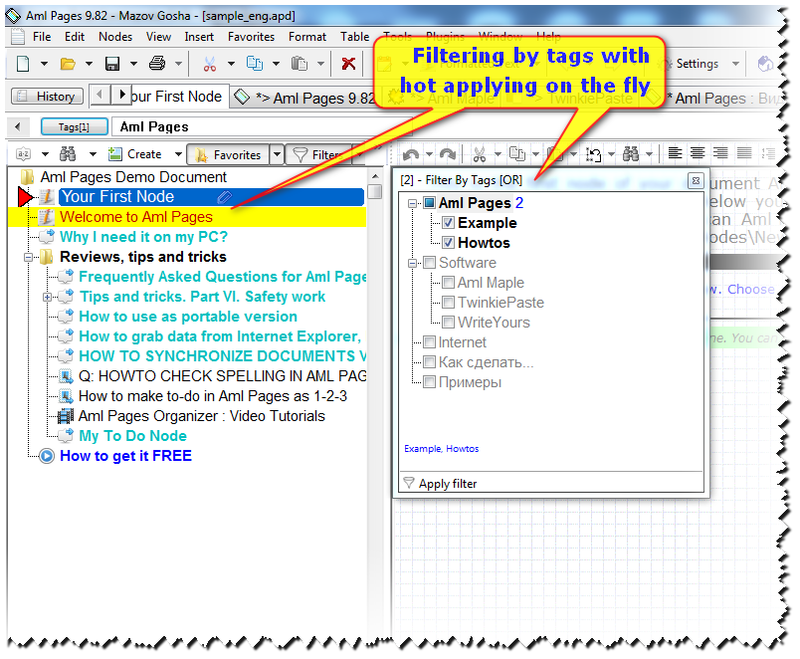 Added: new user interface for filters by tags (with pane and hot applying). Impove supports of hi-dpi monitors, many changes and impovements. Details change log see here. Aml Maple 5.36 released. Added: setting "Show balloon on system tray on start". Added: embedded manifest. Details change log see here. You can download version with installer or portable versions.